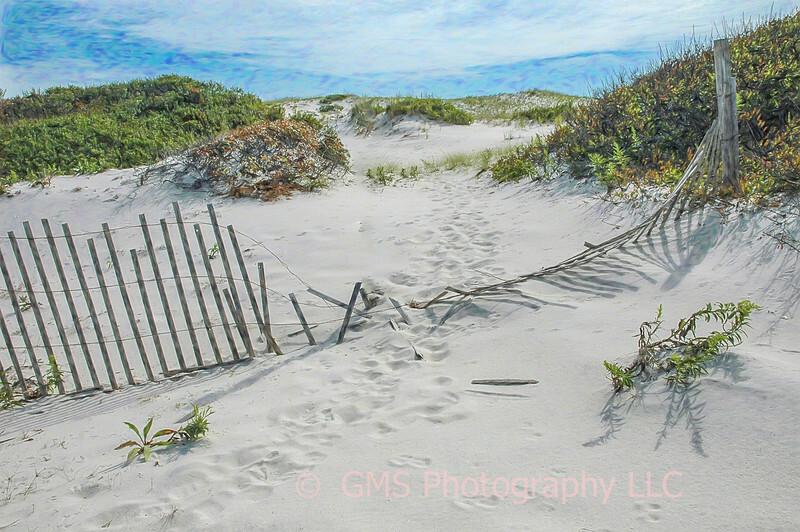 Footprints in the sand dunes and over the broken fence makes this scene appear as though people have somehow moved over or through the fallen fence on their way to or from the ocean. The location of this scene is Island Beach State Park. Island Beach State Park is a 10 mile barrier island in Berkeley Township, New Jersey that is sandwiched between the Atlantic Ocean and Barnegat Bay. It is composed of 3,000 acres of coastal dunes and was first discovered in 1609 by Henry Hudson. The island is home to maritime plants and varied wildlife. Natural communities that thrive here are thicket, freshwater wetlands and primary dunes. This environment makes the area an accommodating home to many varieties of birds such as osprey and peregrine falcons. Island Beach has a widespread reputation for its unique resource of over 400 types of plants.